A Quick Navigation Menu giving an overview of each Great Wall of China section and location divided by Region and Province. From East to West. Very General Main Overview Map of Beijing City Entire , All City Districts, All Areas within the 6Th ring road, Very General Map of Beijing City Center , Very Accurate Detailed Map of same area Beijing City Center within Beijing's Third Ring Road. Gives access to digital photographic tours of main sites within area of Map. 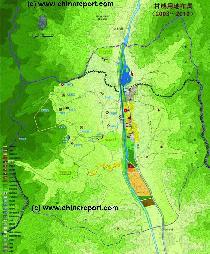 All maps of Beijing Municipality , Area's and Excursions outside Beijing City. Adjacent Map gives direct access to the City of Beijing Map by Google Earth. JiangJun Guan - Generals' Pass Great Wall of China Site Map, Overview Map of Jiangjunguan depicting the entire Valley with the Newest Village in the South, the New Village in the Middle, and the Old Town Area in the North just inside the Great Wall of China at Jiangjunguan Pass. 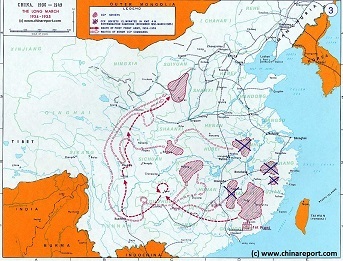 Map includes all Beacon Towers and both the Western and Eastern Sections of the Great Wall of China at Generals' Pass. 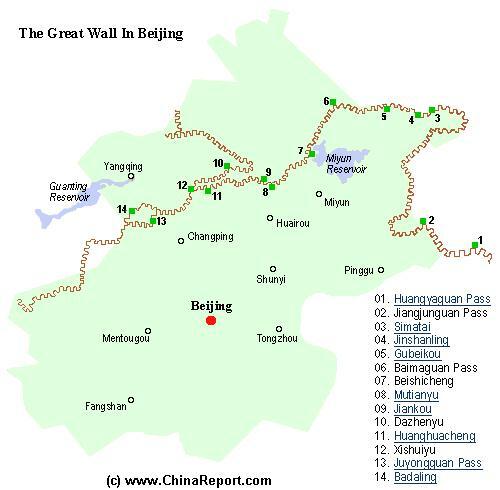 Below is a short listing of alternative Overview Maps of the Great Wall of China. The first miniature map only provides an overall impression of the entire length of the Great Wall of China and the main fortresses that supported it. From East to West these were Qinhuangdao (Shanhaiguan), Beijing, Zhangjiakou (Kalgan), Datong, Yulin, Yinchuan, Lanzhou, Wuwei, Zhangye and Jiuguan and Jiayuguan. 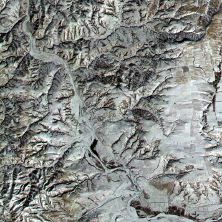 The 2nd Map provides a rough schematic of the Great Wall of China as it existed during the Ming Dynasty (1368 AD - 1644 AD) and is combined with a Google supported Satellite Map of the remaining ruins that can be found today. The third available Map provides a rough schematic overview of the "layers" of the Great Wall, as they were built by various consecutive Dynasties but generally for the same purpose. 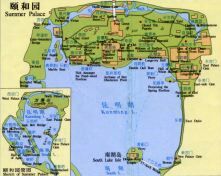 Below is a listing of all ChinaReport.com Maps relevant to the Great Wall of China in Beijing City Province (and adjoing regions). 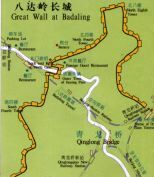 The China Report map provides an overview of the various parts of the Great Wall of China and the main and most well-known visitable locations. In between of these points there are many more. Cities in China provide better comprehension of the position of the Great Wall versus the various Cities of the Chinese heartland which it was built to protect. Please note the outer layer stretching from the Korean Peninsula to Hohhot in Inner Mongolia. This stretch was added in the late Ming Dynasty as protection against Manchu. the Ming Dynasty. Main Features are Names and locations location of Passes on the Great Wall of China, outer layer and inner layer. Includes Shanhai Pass, Huangya Guan (Yellow Cliff) Pass, JiYunGuan Pass, Ningwu Guan Pass, Pingxin Guan, YaMen Guan Pass, Pian Guan Pass, JiaYuGuan pass, YuMen Guan Pass (Jade Gate) and Yang Guan Pass. All Maps of the Great Wall of China in Tianjin City Prov.